Many patients that attend our clinic are always surprised to see the video playing in the waiting room that shows the treatment of a three year old girl. They are amazed that children need treatment at all, after all they are not old and degenerating! However, the child’s framework is no different from adults in that it needs to distribute the forces placed throughout it efficiently and if it cannot do that, strain and injury to tissues can result. They also have the added mechanical strains that can be caused whilst they are ‘growing’ throughout their childhood and into their adult skeleton – these growing phases often disrupting their mechanical framework. 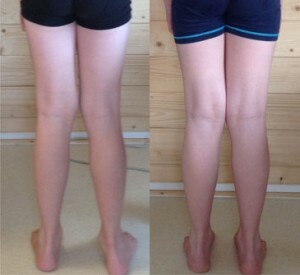 The left photo show a patient before a course of treatment at Balance-Rite Osteopathy Clinic. The improvement can be seen in the right photo. Click on image to enlarge. We often see children who have been investigated thoroughly, without any apparent underlying cause for their symptoms. One such case was that of an eleven year old boy suffering with ankle pain. In these before and after treatment images, you can visibly see why he was suffering pain!